The Regional Institute of Education Mysuru ( Formerly Regional College of Education ) founded on 1st August, 1963, is one of five such institutions established by the National Council of Education Research and Training (NCERT), New Delhi. Four year integrated B.A.Ed. course in social science and humanities education with an intake of 40 students from southern states. 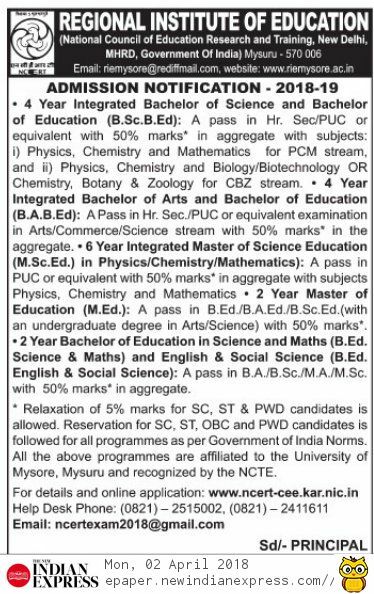 Four year integrated B.Sc.Ed. courses in science and mathematics education with an intake of 60 students from southern states. Six year integrated M.Sc.Ed. programme with an intake 15 students each for mathematics, physics, and chemistry from all over the country. Bachelor of Education (B.Ed.) degree programme. This programme will be of two year duration organized in the semester pattern with 2 semesters in a year. One-year M.Ed. course with an intake of 50 students from southern states. One-year Diploma Course in Guidance and Counselling (PGDGC). Ph.D. in Education, and science - the institute is a research centre of the University of Mysore and there are currently about 50 research scholars pursuing their research leading to Ph.D. in education.